So the bus ride from San Pedro to Salta was officially the bus ride from hell! Both Lindsey and myself were extremely hung-over, somehow the boys all seemed to pull up ok though – not fair! At the bus station it was a bit unfortunate that two Aussies waiting for a bus had their bag with their passports and money stolen! Our lovely helpful guide went to give them some advice, but it made me feel very glad to be part of a group that day! We piled onto the bus ready for a twelve hour stint in purgatory. Both myself and Lindsey bagged double seats so we could sleep. I managed to sleep for a few hours and generally felt a lot better and managed to eat some more food. We then crossed the border over into Argentina and had to have our bags all scanned again. It was good to get out of the bus and get some fresh air too. The road then got extremely winding and although the views were spectacular it was also vomit inducing and it was a totally miserable afternoon. I think the travel sickness wrist bands helped but it really was just an awful journey in all. We were all very glad to reach the bus station and head out to the hotel, which was only a few minutes’ walk away. The hotel is really nice, it’s actually a converted house and so it has a really nice relaxed feel to it. It’s also nice to stay somewhere that no one else apart from our group is staying at the moment. I got the single room for two nights too. It’s awesome having a double bed and also a bit of personal space after sharing bedrooms for the last however many weeks. I did have a bit of a rubbish moment though when both myself and Karen realised that we had been robbed of secret stash cash in San Pedro. They must have really gone through our stuff as Karen lost $300 with just her middle notes taken, from down in her bag. I lost $180 which was hidden in a pack of children’s pencil crayons in a document holder also down the back of my backpack, so they’d had a proper rummage! I’m always glad I have money stashed in several places though so you don’t lose it all. It’s still annoying though. We did wonder if it was the housekeeping staff as they would have had to have taken quite a long time to go through our things and also they didn’t take all our money, just the larger notes, leaving the smaller ones. I guess this is a tactic so that you don’t realise that it’s happened until you’ve moved on to somewhere else. Argentina is by far the largest country that we have visited so far with a population of 41.1 million. Argentina also crosses from subtropical to subantarctic climatic zones. You can definitely tell that the population is wealthier than any of the other countries we have visited yet and this is a reflection of the higher level of education and rich resources of the country. However the country has a troubled past with multiple dictatorships, the worst being in the late seventies to early eighties and then recession in 2001 which left 50% of the population below the poverty line – that’s almost twenty millions people. The dirty war, only recently introduced into the national curriculum resulted in the disappearance of tens of thousands of people, mainly in their twenties and many of the bodies have still not been recovered. Whilst the country has recovered to some extent unemployment and poverty is still high. As usual we hit the streets for an orientation walk. We almost immediately came across a demonstration march by teachers in the town. They are campaigning for an improved minimum wage, they want an increase to 5500 pesos per month, around $550 a month. Teachers who are just starting out can be earning only $300 a month here. The first stop on the wall is a memorial in a small park area. The memorial is for all those who disappeared during the dictatorship between 1976 and 1983. It was very interesting to hear Jjamilla talk about her countries history as it’s always different coming from somebody from the country who has family history involved, compared to what you learn at school and from reading about it. It was also interesting to hear the view of the Falklands, previous and existing from an Argentinian person. I have never learnt about the Falklands conflict in any particular detail. From the perspective of the Argentinian people the government essentially sent a lot of young men to die. They were untrained and unequipped. Many didn’t have any military training and were sent directly over there never having ever held a gun before. They also found out that many of the soldiers were supplied with the wrong type of ammunition for the guns they were provided with. Of the young men sent to fight a disproportionate number were from the poorer states in the north of the country as their families could not afford to pay for them to avoid conscription. The northern states are generally warm in climate and many of the men died as they couldn’t cope with the sub zero temperatures on the island. Once they returned they were then taken to camps and fed up to appear healthy before being sworn to secrecy about what happened there during the war. Not exactly the hero’s welcome they had expected. Also many communities gathered large amounts of food stuffs and warm clothing to send as packages through the army. It then turned out that letters written by family members were found in packages of good resold elsewhere. It turned out that none of the supplies that people were donating was being sent over to the solider, it was being collected by the army and then resold back to the public. All in all it sounds pretty bad and the view is worse of the treatment of the people by their own government than towards the British. The continuing feeling is variable but our guide said she recognises that lots of the residents of the island identify as British, but it remains a highly symbolic and emotive topic to be thrown around to distract from other things. 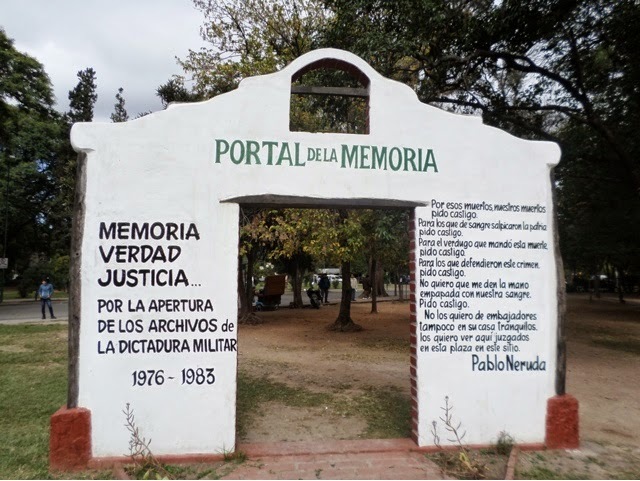 The war memorial, showing a poem written by Pablo Neruda. The town has a cable car which takes people up to a viewpoint across the city, the only way to avoid the 1070 steps up Cerro San Bernardo. Unfortunately it’s closed for the holiday weekend so we won’t be able to take it, we will see if I can be bothered to do the walk! From there I visited the main square, Plaza 9 Julio, the teachers strike was centred there, so it was full of tents. As usual all the important buildings and the city’s cathedral is located there, its pink! Fancy looking hotel… Not quite where I’m staying! 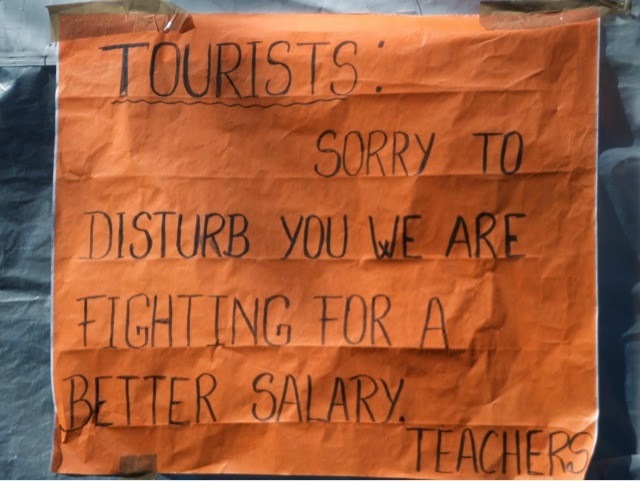 Very polite and underpaid teachers! After wandering through the town the group headed to the Patio de Empanadas, where the best empanadas in the city are sold. I had several different types, all yummy. As they’re quite small it allows you to try lots of different flavours. I had grilled chicken, grilled beef, corn and a fried cheese one. After lunch I walked out to an artisans market. It was located so far out of the centre of the town and in a residential area that I questioned whether it was really there, but eventually got there! It was a really nice market with artisans stalls all located in an old converted hacienda. Actually bought something too, a pair of thongs. In town I was also able to pick up some knitting needles from a haberdashery. Although it was quite fun trying to explain what I wanted to the shop keeper :-). I can now make something with the wool I picked up in Peru… I’m thinking warm socks! On the way back to the hotel I visited the main cathedral and the two churches of the town. 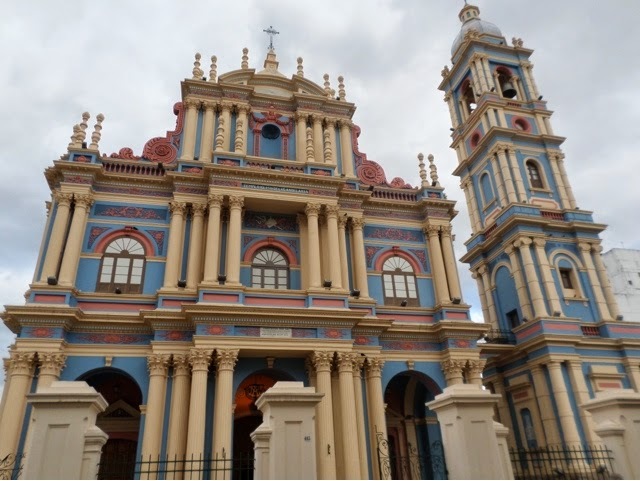 The Iglesia San Francisco is currently being renovated so is only open for tours and the outside is all covered. Iglesia Nuestra Señora de la Candelaria (La Viña) is a beautifully painted church. Although in some ways the blue colour of the building is a shame as it masks the blue roof tiling, which reminded be a bit of the cathedral in Cuenca. Inside it is a relatively simple church, but has some nice paintings. It turned out that I had walked for over eight hours by the time I got back to the hostel and I was glad that in the evening we were just having a BBQ dinner at the hotel. The hotel is actually a converted family home and so it is actually a lovely place to stay. It was so nice to have dimmer round a big table, just with the group and not out in a restaurant. It was great to be able to sit and chill out on a sofa for a while without it having to be in a bar or somewhere noisy. Unfortunately I wasn’t feeling very well the next day. I went for a walk with a few of the girls to see if we could catch the gondola up the mountain. Everything was totally shut down as it was a public holiday called Workers Day. I ended up having a bit of a sofa day, mooching and catching up on some admin and researching exciting new plans…. It was a bit of a shame that we had the public holiday weekend here as I don’t feel that I got a true feeling for the town, or really the chance to get to know it. Also my itinerary changed to stay and extra day in San Pedro, which I am very glad of as I loved it there, but it take mean I lost a day here. After a lunch of leftover BBQ we headed off to catch the bus to Mendoza. I have been really looking forward to visiting Mendoza, home of one of my favourite varieties of wine, Malbec. We also paid for an upgrade to a fancy bus, so hopefully the eighteen hours, yes eighteen, go by quickly! 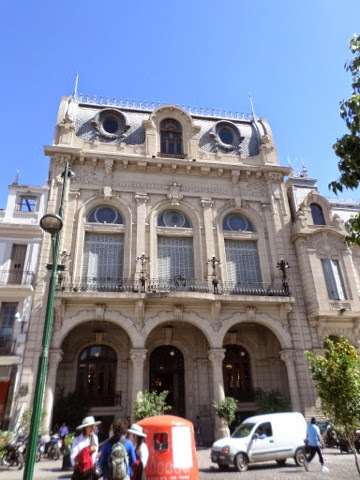 I have three nights in Mendoza, I wonder how many Malbec’s I can fit in :-)… Challenge accepted! 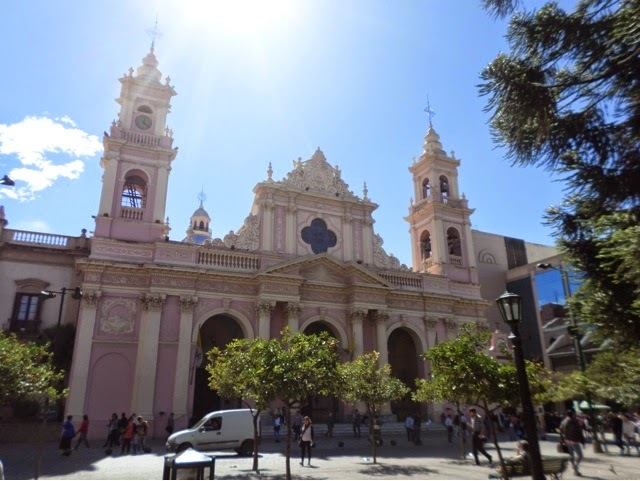 This entry was posted in Travel and tagged Cathedral, Cerro San Bernardo, Chile, church, Dictator, Empanadas, Intrepid, Pablo Neruda, Salta, South America, SouthAmericanAdventure, Strike, Travel. Bookmark the permalink.